Done. I have temporary link for fetch. Login to Vultr and choose Upload ISO. DragonFlyBSD 4.0.1 is out. You can use the iso file from here. Hit upload and wait for while. When iso file successfully fetched from url you’ll see this display. At this stage you can proceed to next step. I choose Dallas, Texas for VPS location. 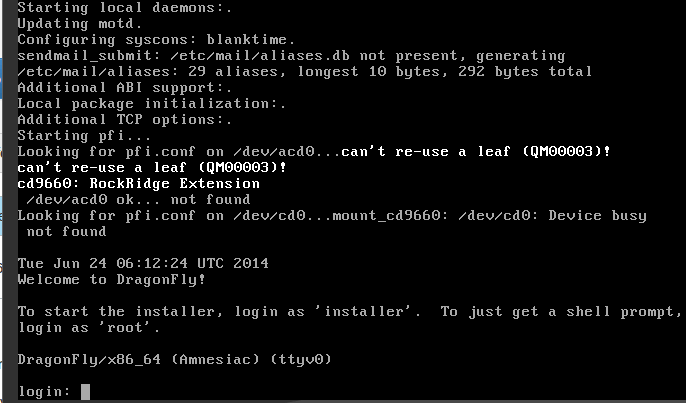 Virtual ISO -> choose DragonFlyBSD iso from previous step. As Vultr don’t know about this OS then you have to install and configure it yourself. To start it then you must use “View Console” to get start. In IP address configuration you must refer to IPV4 section. Address, netmask and gateway must be use exactly as noted. Vultr will copy iso file to location you choose. Time required is depend on location and size. Configure SSH for first time, use this post. Click here to get your own DragonFlyBSD box.